Map of the Norte Chico illustrating both archaeological sites and modern communities. Archaeologists recognize that 5,000 years ago the Norte Chico was the cradle of Andean civilization, the place where complex societies first emerged in South America. 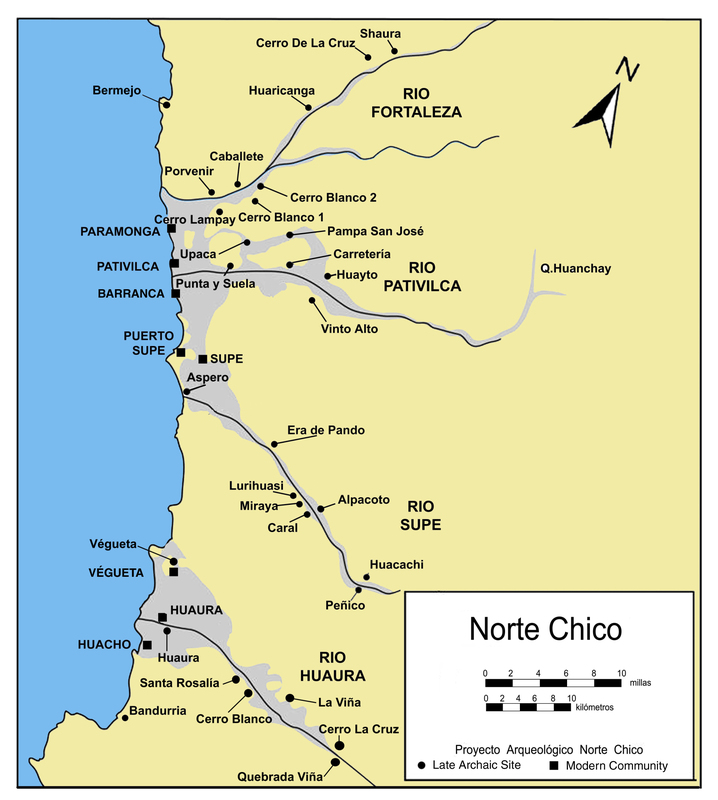 The Norte Chico, or “Little North,” is a region of Peru’s north central Pacific coast consisting of four river valleys approximately 200 km north of Lima (from North to South): Fortaleza, Pativilca, Supe, and Huaura. This region witnessed a unique and extraordinary development of large ceremonial centers dating to the Late Archaic Period ca. 3000-1800 B.C. Archaeological survey has documented 30 major Late Archaic sites in the Norte Chico, all ranging from 10 to 200 ha in area, all with monumental communal architecture, and all lacking ceramics in their surface artifact assemblages. The Late Archaic was a time of dramatic cultural transformations. During this period the first sedentary agricultural communities developed and inhabitants constructed the earliest monumental architecture in the New World. The presence of 30+ major Late Archaic sites recorded in the Norte Chico—a stretch of 25 km along the coast—is a unique cultural phenomenon not seen elsewhere in the ancient world. These sites share an architectural pattern of monumental terraced platform mounds and large sunken circular plazas. Beyond these large public structures, recent excavations conducted by Proyecto Arqueológico Norte Chico (directed by Dr. Jonathan Haas of The Field Museum and Dr. Winifred Creamer of Northern Illinois University) have uncovered multiple smaller temple structures at Huaricanga in the Fortaleza Valley. These temple structures are the focus of this research.